Try a restaurant-quality recipe your family will love. 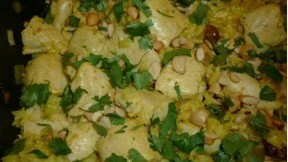 Creamy Curry Chicken and Rice fills the kitchen with a fragrant promise of deliciousness for dinner. In a medium saucepan, bring water, 1 teaspoon of the salt and the saffron to a boil. Add rice and cinnamon stick to pan. Cover, reduce heat, and simmer 20 minutes or until liquid is absorbed. Discard cinnamon stick and set rice aside. Heat oil in a large nonstick skillet over medium-high heat. Add chicken and sauté 5 minutes, or until lightly browned. Remove chicken from pan; cover and keep warm. Add onion and 1/2 teaspoon salt to pan. Cover, reduce heat to low, and cook onion 10 minutes, stirring occasionally. Add curry, ginger, cardamom, red pepper, garlic and serrano; cook 3 minutes until fragrant, stirring frequently. Add dried cherries and stir in yogurt; cook 3 minutes or until mixture thickens slightly. (Nonfat yogurt will curdle but will be absorbed into the rice so it’s not noticeable.) Add chicken and cook about 4 minutes until thoroughly heated. Add cooked rice and stir well to combine. Garnish with chopped cashews and cilantro and serve. If you are trying Meatless Mondays, substitute a can of rinsed and drained garbanzo beans for the chicken. Equally delicious and no need to cook in advance before adding them to the dish.